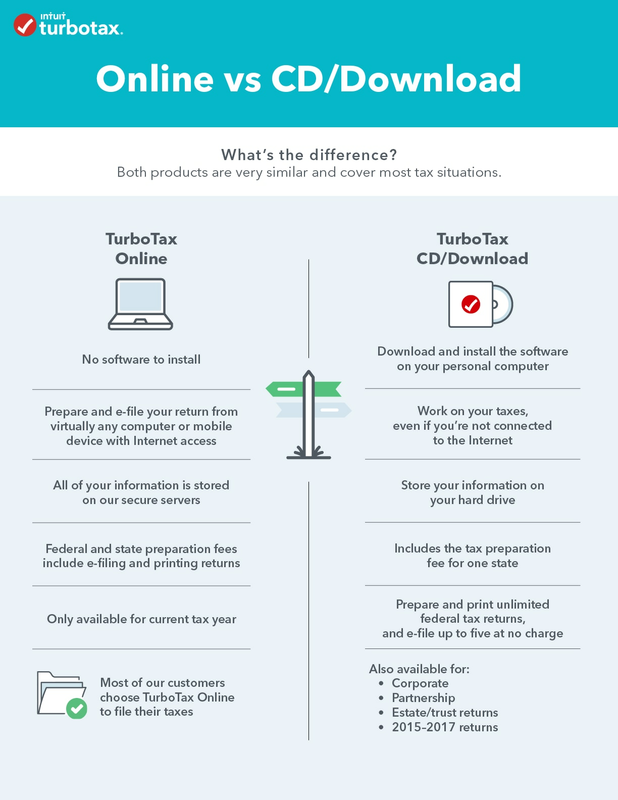 TurboTax Online and the TurboTax CD/Download products are very similar and both cover most tax situations. The majority of our customers choose TurboTax Online to confidently file their taxes. If you file online, we store all of your information on our secure servers. If you use the CD/Download, you need to save and store your own tax return. With TurboTax Online, you can work on your taxes from any computer or mobile device with Internet access. With the CD/Download, you install TurboTax on your computer and you can do your taxes without the Internet. The CD/Download product is a better overall value for people who prepare tax returns for their friends and family. It allows you to prepare and print unlimited federal returns and e-file up to five at no extra cost. There are some tax situations that TurboTax Online does not cover. If you need to file corporate, partnership, and estate/trust returns, or 2015–2017 amended returns, you'll need to use the TurboTax CD/Download products.